As you plan your first steps with waist training, the most exciting decision is surely the styling of the corset that will mark the beginning of your journey- what colours, what textures, what shape will you choose? Here’s a short guide to some of the things you should start to consider before we let our heads run away with the beautiful possibilities. One of the most important where we are concerned is which cut would you like? When we ask this, we are usually referring to two main distinctive shapes that hold within them a world of variation- “hourglass” and “wasp waist”. Hourglass is a term used to describe a cut that largely follows the natural shape of the ribs down from the underbust, till at perhaps half way down to the waist, where it nips in to your reduced waist size. Some people consider this the “beginners choice” because it can be worn comfortably without extended training, and it has the least impact on your ribs. I often recommend this style to individuals with a small “waist to hip ratio” as it can be used to make the waist reduction seem more dramatic than it truly is. An hourglass produces a softer, curvier silhouette, which, to my eyes, focuses attention on the waist point when nicely balanced. A wasp waist is what most people think of when they envision a true Victorian corset, it carries a severe, almost diagonal or conical line between underbust and waist. This tapers the lower floating ribs into an elongated shape through wear, and these changes are permanent. Training a wasp waist is achieved steadily over time, and we make various adjustments in a corset design to accommodate it. I always think that this style gives the most definition to the hips, as the hips usually retain a natural curve and fullness in comparison to the severe lines above the waist. ~NB– this is usually the stage at which beginners ask us if the waist reduction they choose will be a permanent effect. The answer is no- your body shape may change during the course of training through various causes (diet changes, the need for a regular exercise regime etc) but do not expect your waist to retain its corseted shape permanently. The next most important consideration is your lifestyle needs. Most frequently, we are asked to make our corsets as light as possible to remain discreet beneath work-wear and daily attire, certain styles may be more suited to this than others, and depending on your figure type and your choice of clothing some styles may be entirely ruled out. This area will also affect your colour scheme for the corset, for instance, if you wear a white shirt to work every day, a flesh tone corset will likely be essential. You may want the corset to function as smart outer wear for weekends and evenings as well as underwear for the daytime, you may wear clinging clothing that will affect our choices of fixings- all objectives can be accommodated, so make us aware of what you need. When it comes to design, the world is at our feet, we can create the most elaborate and beautiful waist training corsets that are still utterly practical, but these corner stones will help us to keep the styling specific to you and your needs. 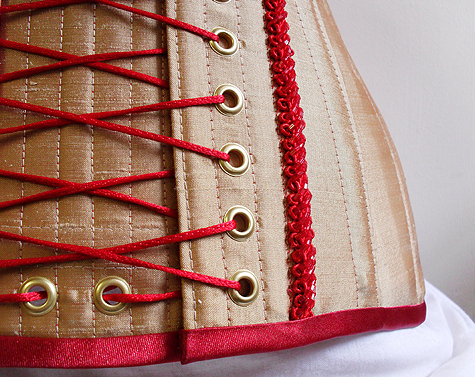 After all, it’s no good giving you an exquisitely made corset that could have been created for just anyone!